Tsuki is a rather unique passive adventure game where you follow the adventures of the main character, Tsuki as he makes his way through various parts of his world. It's a pretty simple game, but one which is a lot of fun as you discover the different things that Tsuki gets up to. There are a few tips and cheats that we can share with you that we know about in the game as well as a small guide to help you get the most out of Tsuki Adventure by Hyperbeard. The game starts with Tsuki in his office, watch him or tap the game to skip through. The next location you'll be guided to in the game is to see his Grandpa and the little carrot farm. One thing that is critical in the game is that you use your in-game currency to purchase items, this will allow Tsuki to do more activities. There are a number of know cheat codes that generate you in-game currency to make purchases, they are below. The codes do expire from time to time, so if you know any new codes, please tap them in the comments to share with others. If no codes are working then try the links above to see if new ones have been published. Cheat codes are entered by tapping the three lines at the top of the screen, then selecting options, the tapping the safe icon, and entering these as safe codes for a reward. Please remember these codes do expire over time, and Hyperbeard do release new codes, if none are working for you, please check the links to Hyperbeard's social media pages which are above. If you know any new codes, please drop them in as a comment below to share with other players. Thanks. The tutorial is over once you purchase the fishing rod in the shop, using the carrots that you have harvested. If you have already spent them, then you can head back to the farm to harvest some more. Slide the screen left and right to take a look at the things you can do. You'll need to keep collecting carrots in order to purchase more items, which will allow Tsuki to do more things in the game. 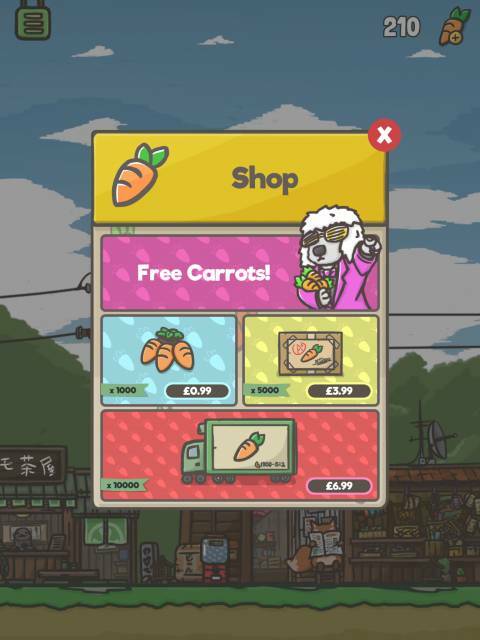 If you tap the carrot icon in the top right of the screen you will go to the shop, here you can purchase carrots for real money or get free carrots by completing an offer or watching an ad. You'll have to decide for yourself if the offer is worth it or not for you. Also, sometimes when you tap on characters in the game you can be prompted to watch an ad in exchange for carrots. Sometimes it appears there is nothing to do in the game, it's at times like this you could probably shut the game down and come back another time to see if Tsuki is going to get up to anything new when you return. If you see the other characters in the game, give them a tap to see if they are saying anything new. You may be pleasantly surprised, especially if they give you some carrots. You have the option in the game to go fishing from time to time. If you catch fish, these can be sold for carrots in the game. First of all you'll need to purchase the ticket, then meet the wolf which appears near Bobo's shop. If you don't go right away, you more likely to find him appearing in the game i the evenings or weekends, but also you may not see him for a while. During the game, at some point in your progress, the duck will being to appear at the pond. If you tap the duck you may get an egg which you can then sell to Yori the Fox. He purchases them for 10 carrots per egg. However it may take multiple taps before you get an egg from the duck. This means you need to close you game and reopen it and do the process over and over before you finally get the message about the duck dropping the egg. 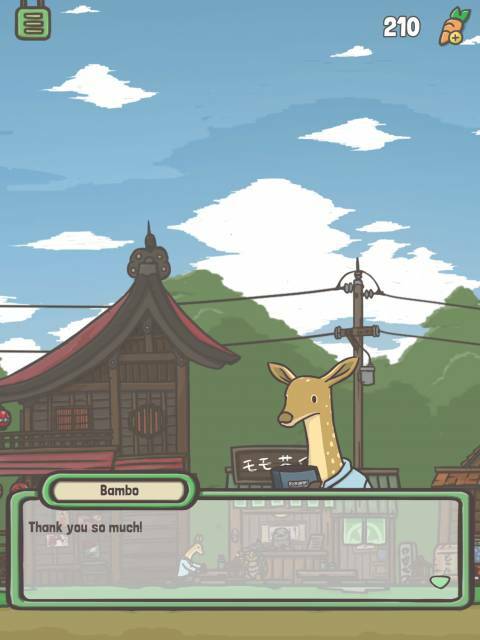 Tsuki will get up to different things on different days and different times, so vary your playing time to see what kind of things are happening in the game, and what other characters are available to interact with.